A personal 'state of the art' reading comprehension clinic at your fingertips! 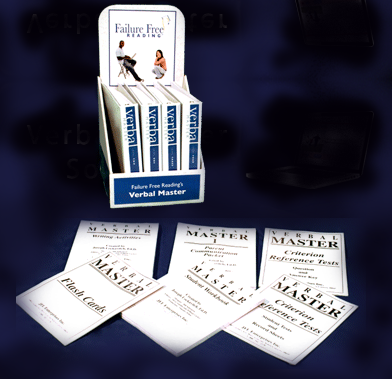 This is the most intensive, fastest-acting online reading comprehension intervention available. Backed by over thirty years of on-going research and published in nine national and international peer-reviewed reading research journals. This is the 'meat and potatoes' brain-based software package specifically designed to 'fast-track' the reading comprehension, expressive fluency, vocabulary, spelling, written composition and confidence of your chronically failing readers. The online software, abundant downable PDFs and the abundant reporting features, turns your class into a complete 'state of the art' reading clinic. This license gives you immediate access to ALL LEVELS of Failure Free Reading’s Diagnostic/ Prescriptive/ Instructional Online Solutions, including: Joseph's Readers Elementary Online Software, Verbal Master Middle and High School Online Software, and Life Skills - A School to Work Transition Online Software Intervention for Special Needs High School Students with IQs as low as 35. Perfect for RTI Tier III. Suitable for Grades 1 to adult. Perfect for: at-risk, minority, English Language Learners, Deaf, Specific Learning Disabilities, RTI Tier II and Tier III, ID, BEH, TBI and students with Autism. Oral and visual online directions come in English, Spanish and ASL video clips. This is the program you must have when all other interventions have failed to produce the growth in comprehension and expressive fluency you desperately seek. Even better, this software comes complete with a very easy to use 'quick start guide' and access to online training videos and resources. Everything you need to change the reading ability and confidence of a chronicaly struggling student in a very, very easy to use format. Start almost immediately thanks to our quick start guide and instructional videos. 12 month Online License: Includes access to Online Diagnostic Prescriptive, access to all levels and lessons in the methodology, online testing, instructional recorded training videos, online reporting, the Electronic Library of pdf files for all our print materials, all technical support, data archiving/hosting and access to the Reading Attitude Survey. Unit Price is $150 per licence. While the license is transferable, it can only serve one student at a time. access to our really easy to use 'quick start' guide and abundant pre-recorded “how-to” training videos and informative implementation handouts/checklists. Only need some of our Life Skills Offerings? 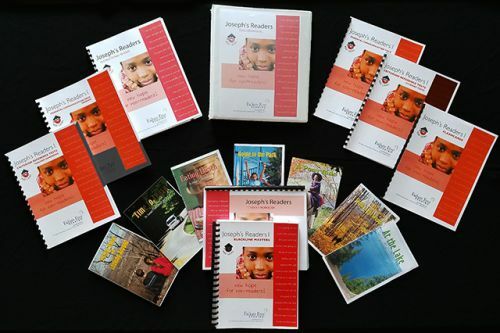 Elementary Teacher Print Pack - Nonconsumable Print Includes: 1 Teacher Manual for each of the Four Red, Green, Orange and Teal Levels, 2 Instructional Readers per Level, 1 Parent Communication Pack, 1 Criterion Reference Blackline Master Measuring Pre/Post Test Growth in: Word Recognition, Oral Fluency and Silent Reading Comprehension for each of the 27 Instructional Stories, 1 Student Workbook per Level, and 1 illustrated copy of each of the 27 instructional stories) Serves Reading Levels of 0.0 through 5th Grades Perfect for: Overage nonreaders, At-risk, Minority, English Language Learners and Special Education including: Deaf/HHI, SLD, ID, BEH and students with Autism. Elementary Print Solution (also known as Joseph's Readers) serves 0.0-5th grade reading levels. Multi-sensory, non-phonic language development, expressive fluency and reading comprehension program for non-readers! 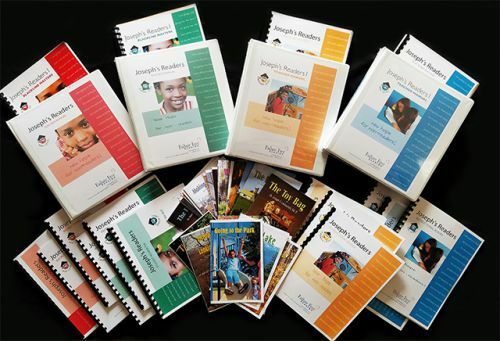 Failure Free Reading’s original research-based, non-phonic, connected text program explicitly teaches word recognition, comprehension and expressive fluency in the context of age-appropriate stories controlled for repetition, syntax and semantics. Following placement using a software-based Diagnostic/Prescriptive assessment, small group, pullout or individual instruction follows a consistent 3 Step Methodology designed to build confidence, independence, and maximize time on task! Mastery of these 2,000+ unique academic English words will allow students to read 90% of the words seen in grades 1-9! Elementary Teacher Pack helps the Teacher/Parent by providing non-consumable print materials and blackline masters that allow you to use the program year after year. 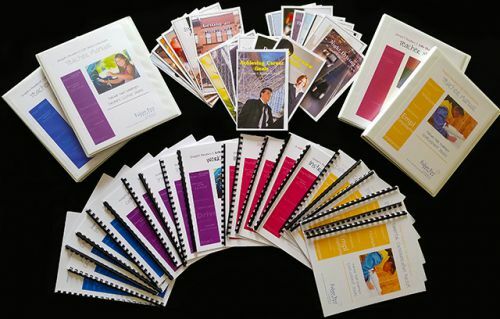 Print materials included: One - Teacher Pack with four levels (Blue, Purple, Maroon and Yellow) - 1 Teacher Manual for each color level, 2 Instructional Readers per color level, 1 Parent Communication Pack per color level, 1 Criterion Reference Test per color level, 1 Student Workbook per color level, and 1 copy of each of the 21 stories. Blue, Purple, Maroon and Yellow Levels serves reading levels of 0.0 through 5th Grade. Online Software materials included: Ten - 12 month Online Student Licenses: Includes access to the student Online Diagnostic Prescriptive, access to all levels and lessons in the methodology, online testing, instructional recorded training videos, online reporting, the FFR Electronic Library of pdf files for all our print materials, all technical support, data archiving/hosting and access to the FFR Reading Attitude Survey. Licenses are transferrable by inactivating old students and activating new students. Unit Price is typically $150 per Online Student Seat License, but this is a special time sensitive package from FFR! The Life Skills Print and Online Software Classroom Special Package solution serves students on the spectrum reading at 0.0-5th grade reading levels, specifically designed for over-aged learners and/or students in high school or transition classrooms. A multi-sensory language development for your non-readers! 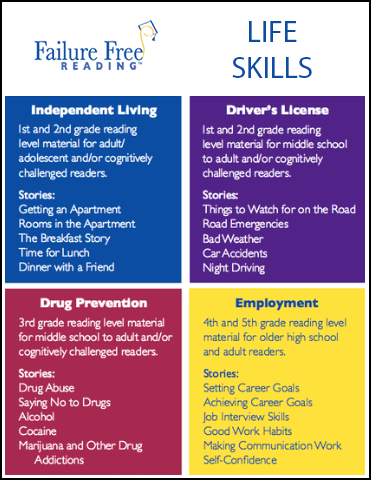 Life Skills is a special edition of Failure Free Reading that teaches students on the spectrum and/or cognitively challenged secondary-adult students to read age & developmentally appropriate content. Perfect for self-contained, resource or community-based instruction classes. Life Skills can be used with the basic English or social skills curriculum. The four levels/themes of Life Skills are: Independent Living-Blue Level, Driving-Purple Level, Drug Awareness-Maroon Level, and Employment-Yellow Level. Life Skills is for students/children/adolescents/adults reading with a 0.0-5th grade reading level and IQs as low as 35. Life Skills is suitable for: Ages 12-Adults: early reading, beginning English Language Learners, at-risk, and special education populations: autism, learning disabilities, intellectually disabled, deaf/HH and dyslexics. Life Skills teaches mastery of the critical vocabulary essential for reading success such as: the most common words and critical life skill vocabulary centering on four themes: getting an apartment, getting a driver’s license, getting the facts on drugs and getting a job. Life Skills is designed to give students with reading abilities as low as 0.0 and cognitive IQs of 35 and higher the chance to read with fluency and comprehension from age appropriate theme and appearance. Life Skills is a special edition of Failure Free Reading that teaches cognitively challenged secondary-adult students to read age & developmentally appropriate content. Perfect for self-contained, resource or community-based instruction classes. Life Skills can be used with the basic English or social skills curriculum. Based on the notion that all reading programs work but not for all students, Failure Free Reading’s non-phonic first reading intervention is the front-end for your lowest literacy special education and beginning English Language Learners students who are not reading well enough to benefit from more advanced leveled literacy interventions. Failure Free Reading Print is a nationally recognized, non-consumable reading intervention specifically designed for students who need a non-phonic first alternative or for your over-aged students who have mastered basic phonics and decoding skills but still lack solid comprehension and expressive fluency. Failure Free Reading Print focuses on the research-based best practices designed to significantly produce critical growth in comprehension, vocabulary, fluency, writing, and independent reading instruction. 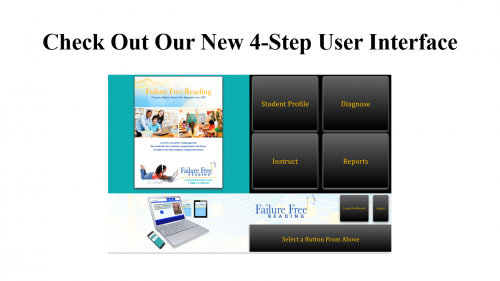 Easy to use and highly redundant Failure Free Reading Print gives chronically struggling students the opportunity to master critical academic words essential to future reading success within the simplest and most comprehensible connected text. Failure Free Reading is the first intervention to specifically control for the eight content roadblocks preventing chronically struggling readers to read for meaning. Scaffold learning in ways that would be impractical to provide otherwise. Now, even your hardest-to-reach learners, those reading, as low as 0.0, can develop effective communication skills, work habits, job interview skills, and self-confidence - all while learning to read! “Every student is making progress and it is so engaging that I have a hard time getting them off the program. It is age appropriate, and it is showing improvement in the reading and writing ability of all the students. Image is everything. Middle and high School students reading well below third grade level don’t want a program filled with childish elementary content and images. Fortunately, your students can do much more. Your adolescent non-responders who couldn’t sound out the word “rain,” will learn to read, write, and spell age appropriate words, such as, “precipitation” regardless of their prior reading ability. Failure Free Reading's materials use only real world situations with NO DANCING BEARS OR BUNNY RABBITS. Red Level is the first of Failure Free Reading eight instructional levels ranging from beginning first grade to SAT/ACT content. Red Level is for students with a K-1st grade reading level. Red Level's real world content is suitable for: all ages, beginning English Language Learners, at-risk, RtI Tiers II and III interventions, and special education populations: autism, learning disabilities, intellectually disabled, deaf/HH and dyslexics. 7 Red Level stories containing a total of 70 pages, 59 sentences, and 643 running words! 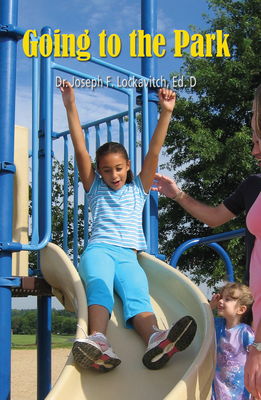 Red Level – Story 1 - “Going to the Park” is the first story from the Red level of Failure Free Reading’s eight instructional levels. Red Level is for students with a K-1st grade reading level. Red Level is suitable for: Ages 5-10 yrs. : early reading, beginning English Language Learners, at-risk, and special education populations: autism, learning disabilities, intellectually disabled, deaf/HH and dyslexics. Red Level - Story 1 “Going to the Park” sets the stage for the seven interrelated stories found in this level based on the common theme of going to a park. In this story, your student/child will read about the many different things one sees in the park. In this story, the person starts out on this trip with his/her mother and father. 5 pages, 33 unique words, 82 sentences, and 643 running words! 10 pages, 70 unique words, 209 sentences, and 1818 running words with a Lexile Density of 3.96. This is an electronic copy of the printed version of this story and its instructional materials, available for you to download immediately. Red Level is the first of Failure Free Reading eight instructional levels ranging from beginning first grade to SAT/ACT content. Red is for students with a K-1st grade reading level. Red Level is suitable for: Ages 5-10 yrs., beginning English Language Learners, at-risk, and special education populations: autism, learning disabilities, intellectually disabled, deaf/HH and dyslexics. six different interrelated software applications per lesson, designed to teach word, sentence, paragraph mastery, as well as spelling. access to abundant pre-recorded “how-to” training videos and informative implementation handouts/checklists. This is the printed version of this story and its instructional materials, delivered by postal courier. 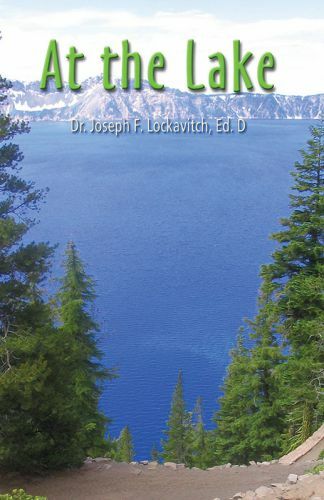 Red Level – Story 2 - “At the Lake” is the second story from the Red level of Failure Free Reading’s eight instructional levels. Red Level is for students with a K-1st grade reading level. Red Level is suitable for: Ages 5-10 yrs. : early reading, beginning English Language Learners, at-risk, and special education populations: autism, learning disabilities, intellectually disabled, deaf/HH and dyslexics. ©2015- JFL Enterprises, Inc. - All rights reserved.